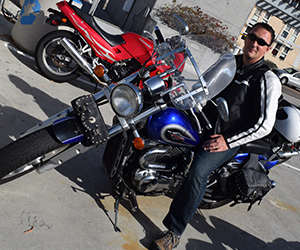 Positioned on top of Pangea Parking Structure, the preferred parking for the UC San Diego School of Global Policy and Strategy (GPS), Brian Foster puts the kickstand down on his blue Suzuki Marauder. Despite the “block O” emblem on his helmet that represents his undergraduate alma mater, Foster could pass as what many consider a typical graduate student at UC San Diego. But like most of his fellow MAS-IA classmates, he isn’t. 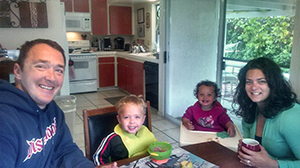 Foster is a husband, father of two and captain in the U.S. Army. He has served as a field artillery officer in Iraq and Afghanistan, as well as a signal officer in the special operations community. His current mission? Get a degree, a regionally focused one. It’s all a part of his training to become a Foreign Area Officer (FAO), a position that in August will station he and his family in Beijing. In complement to our Storify tour of a day in the life of Foster, we also asked him a couple of questions for more on what led him to the School and what the MAS-IA degree program entails today. Was it always your intention to make a career out of serving in the military? For those who don’t know, what does being an FAO mean? What led you to GPS now? How do you strike a work-life balance? Has anything surprised you about the MAS-IA program? Visit Storify to see a typical day in the life of Foster.